The ashes of late Star Trek actor James Doohan have been found in mountains in the US state of New Mexico, where they landed after a brief flight in space. The capsule containing his remains - and those of 200 other people - had been missing for three weeks, after falling back to earth from sub-orbit. A rocket operated by a private company fired the remains to a height of 72.7 miles (117 km) - the edge of space. James Doohan played Engineer Scotty in the original Star Trek TV series. He came to be associated with the catchphrase, "Beam me up, Scotty". Before his death at the age of 85 two years ago, he had asked for his remains to be sent into space. The rocket containing some of Doohan's ashes was the first to be successfully launched from the Spaceport America site in New Mexico. The capsule containing the ashes spent some four minutes at the edge of space before coming back to earth. It landed roughly where expected, according to the company operating the rocket. However, bad weather and steep, rocky terrain reportedly delayed the recovery of the capsule. Also on the flight were the ashes of astronaut L Gordon Cooper, one of the first men into space. 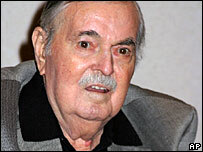 Wende Doohan, James Doohan's widow, told the Associated Press news agency her late husband "probably wished he could have stayed".